Grout Systems installed Augercast Piles and Micropiles in two phases to support the construction of six settling tanks for the Northeast Ohio Regional Sewer District (NEORSD) Early Secondary System Improvements (ESSI) being made to increase the plant’s capacity for processing wastewater. In Phase I, we installed 962 – 24” diameter Augercast Piles each 60’ in length reinforced with eight #10 rebars with #4 ties extending the full length of each pile. Sixteen High-Strain Dynamic Pile Load Tests (ASTM D4945-12) were performed. Design loads ranged from 150 kips to 245 kips with a safety factor of 4.5. Test piles were randomly selected and 10% of the piles were PIT Tested (ASTM D-5882-07R13). 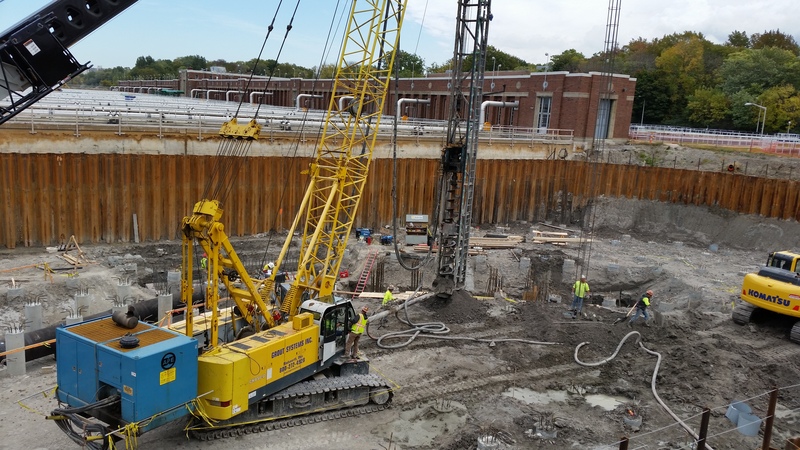 In Phase 2 (Effluent Structural Modifications), we designed and installed 12 Micropiles with 14’ of headroom in a confined space.